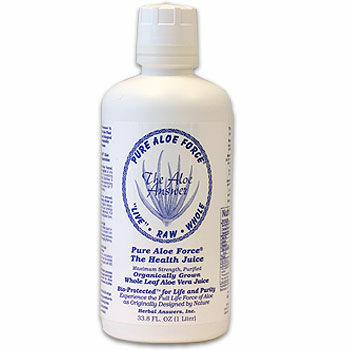 Pure Aloe Force® Juice is an immune-boosting powerhouse! Due to popular demand, Herbal Aloe Force no longer has Sodium Benzoate as an Ingredient! Unlike its herbal counterpart, this juice is 100% pure aloe vera, making it ideal for anyone with herbal sensitivities or allergies. Among it's over 250 different cofactors are vitamins, minerals, growth factors, essential fatty acids, and polysaccharides. Aloe Vera has been shown to balance stomach acids, promote healthy tissue linings, and improve digestive function. This Aloe Vera is produced using the patented Bio-Protective method of processing, whereby no heat is ever used and no water is ever added. The bitter aloin (laxative) compounds have been removed to ensure ease of digestibility. Because Aloe Force uses the whole leaf, the juice contains maximum potency while the natural proportions of the aloe vera are maintained.